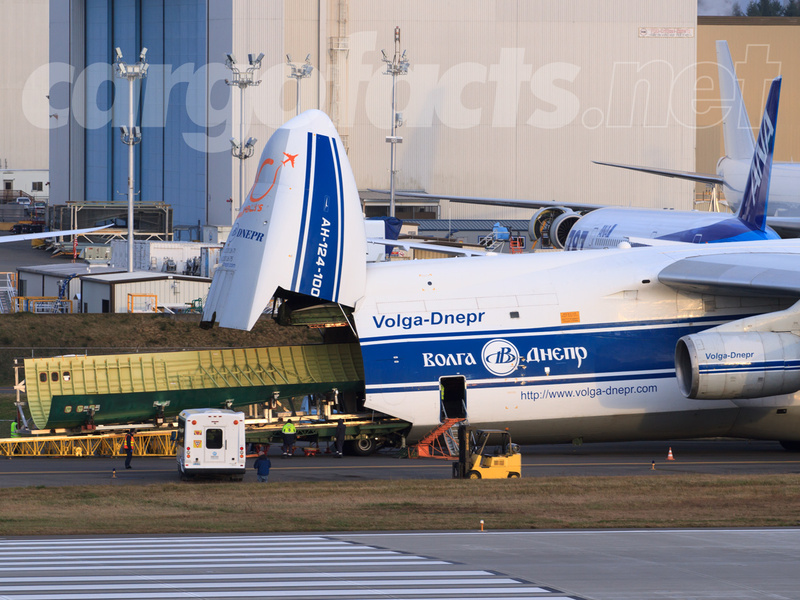 In this unusual scene, captured over the weekend, a Volga-Dnepr Antonov An-124 is unloading a fuselage section for a 747-8F. Although the An-124 has been used in the past to transport components to Everett, it is a very rare sight these days and most parts of this type are shipped by rail (or, if they are for the 787 program, shipped on the 747-400 LCF “Dreamlifters”). This is also the second visit of a Volga-Dnepr An-124 to perform this task in the last two weeks, an almost unprecedented event. As noted, upper-deck fuselage sections such as this typically arrive from Triumph Aerostructures, in Fort Worth, Texas, on a rail car. Sources indicate that a panel was damaged during construction, so one of these panel sets – which included an upper deck aft section (from the upper deck windows back to the full blending of the upper deck into the fuselage) and a aft fuselage upper section, was previously flown in on Feb. 11. The reason for flying in the set this weekend is unknown. Both sets were for 747-8 freighters. The AN-124 is one of the few aircraft able to perform this duty – one of the many specialized missions that Volga-Dnepr uses them for. The open nose, integrated ramp, and “kneeling” nose gear take some time to set up but make it possible to load and unload large panels easily. An extra ramp of trusses is seen here that allowed the pallets holding the panels to be rolled out without flexing and be loaded onto large flatbed trucks to be taken into the factory. The loading location here was also unusual – you’ll note that runway 16R/34L is in the foreground here – with the Antonov parked on taxiway alpha. The wingspan of the An-124 is so large that it encroaches on the runway when unloaded at this location. No jet movements were scheduled for the rest of that day, so this did not present any issue. Although Paine field is best known as the home of Boeing’s wide bodies, it actually doesn’t see very many jet movements per day – usually less than a dozen including business aircraft.